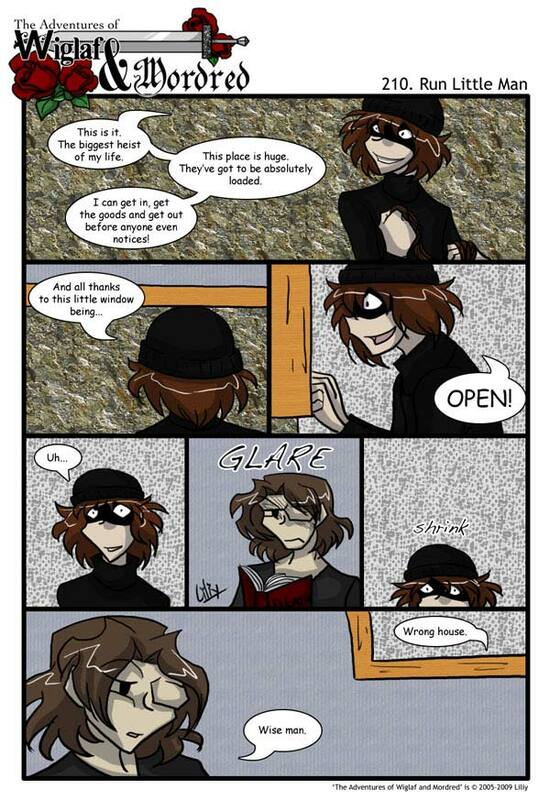 Generic Burglar is back! I figured he’s got a tag and eventually will have a cast page…he should probably show up in more than two strips. Too bad he um, doesn’t do his homework. Ha ha… not too bright, that one. I think I know why security want Haenf’s computer. He wants to catch this man… but why? what does security know about this man? Is he a infamous criminal known only by evil men? Does he have the same ability as security? who knows? Hmm… I like this idea of yours, Liliy. “An Interlude with the Generic Burglar.” Do we get to explore the Garrott family compound with him? Will we see guest houses, and dragons, and stables (oh my)? Are you going to reveal his real name in this interlude? He looks like a “Chuck,” but that can’t be right.